Herbal is a high level behavior representation language that is realized through an integrated development environment -- consisting of a high-level language, a compiler, and a graphical editor -- that acts as a first step towards creating development tools that support the wide range of users of intelligent agents and cognitive models. The Herbal environment currently supports the creation of models for the Jess Expert System Shell, the Soar Cognitive Architecture, and ACT-R. If you are currently using one of these, or plan on learning how, it may be worthwhile for you to try out Herbal. Herbal has beenfunded by the Office of Naval Research and was designed and developed by Frank E. Ritter, Steven R. Hayes, and Mark A. Cohen in the Applied Cognitive Science Laboratory located in the College of Information Sciences and Technology at Penn State University. Additional tools and extensions have been created by Maik Friedrich and Jaehyon Paik. Herbal operates as an Eclipse plug-in. As a result, users who are already familiar with Eclipse should have no problem getting started with Herbal. If you have never used Eclipse you can benefit from a large selection of tutorials and books written to help users quickly learn how to take advantage of the Eclipse environment. 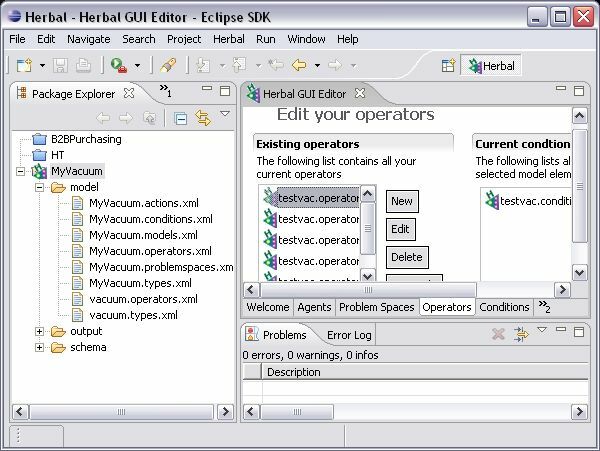 To support both beginner and advanced users, Herbal allows modelers to create models using either a graphical editor (Eclipse) or by directly editing an XML-based high-level language. Herbal's high-level language is based on the Problem Space Computational Model (PSCM), allowing for models to be created at a level of abstraction above the standard production level. Herbal's design has been highly influenced by usability studies done in undergraduate courses in human behavior modeling and artificial intelligence. 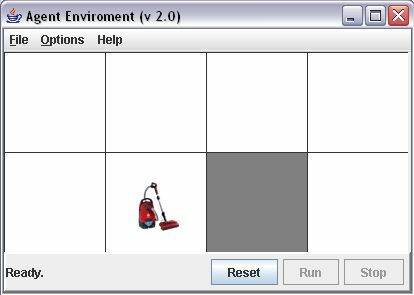 To help users quickly learn how to use Herbal, two simple graphical agent environments are also available for download: the vacuum cleaner environment and the dTank environment. The vacuum cleaner environment was developed at Lock Haven University by Mark Cohen and is based on the vacuum cleaner world introduced by Russell and Norvig in their popular text book Artificial Intelligence: A Modern Approach. This environment has been used to teach rule-based programming at the undergraduate level and can be used with, or without Herbal. The dTank environment allows programmers to create tanks using Herbal that compete against each other in a simulated battle. The Herbal tutorial walks the user through the creation of a simple vacuum cleaner agent and a dTank agent.